Our first sanctioned tournament was a great success! 35 players competed, and 172 matches were played! We had a great time hosting, and I'm already thinking about ideas for our next tournament. Here are links to the match results and a few photos. In two weeks from today, we are hosting our first USATT sanctioned tournament, and we couldn't be more excited! We already have 31 players registered! The limit is 50, so make sure to sign up and reserve your spot. The last day to register will be Thursday, August 24th. Click here to register online at: www.omnipong.com (scroll down to the WA state tournament listings). Adding more barriers for less court interference. Covering the white walls to help with contrast for the ball. Offering a delivered lunch option from tournament sponsor HaHa's Teriyaki. We will have several door prizes (see photos below), a Donic Gym Bag, a Tibhar hardcase, and a Tibhar blade. I hope that you'll consider joining us for what promises to be a great time! Please feel free to contact me if you have any questions! 2) Fees - Starting in September, our fees for Drop-In and League play will be $3 for members and $5 for visitors (1st time visitors for Drop-In are free). 5) New Balls - We have decided to use Nittaku Premium 40+ balls for our Tournaments and League play. These balls have become the standard for most USATT tournaments including the US Open and Nationals tournaments. For Drop-In, we will be switching to Nittaku practice balls which will play more closely to the Nittaku premium balls than our current XSF seamless 40+ balls. I will be testing 2 different types of Nittaku practice balls tomorrow, and you are welcome to test them as well. Just let me know if you’d like to test them. 6) Tournament - Our next Tournament and Pizza day will be Saturday, October 1st. So, mark your calendars! I’m planning to add some additional value and prizes to our upcoming tournaments, so stay tuned for more info on that! 7) Labor Day Weekend - We will continue our Monday, Wednesday, and Saturday Schedule through the end of August, and then we will be closed for Labor Day Weekend. At the beginning of 2015, I weighed 205 pounds. I decided to play table tennis at least 2 times a week. By July, I weighed 180 pounds. Yep, I lost 25 pounds from playing table tennis. I didn’t change my diet. I didn’t do any other exercise. I just practiced. It was fun, I improved my skills, and I lost weight. 2. It’s an inexpensive hobby and your first 4 visits are FREE! If you’re a new visitor, your first four Drop-in sessions are free. It takes a few times to become acclimated to the game flow and to decide if this game is something you want to take on as a hobby. After that, it is only $2 per session. We have quality paddles for you to borrow if you don’t have your own. So, it’s a pretty cheap sport to play compared to most other sports in terms of equipment and gym/membership fees. When it comes to professional quality playing conditions, our club is the best in the area. In fact, we have had several visitors over the past year say that it is one of the nicest part-time clubs they’ve visited in the U.S.! We have eight Joola 3000sc tables. 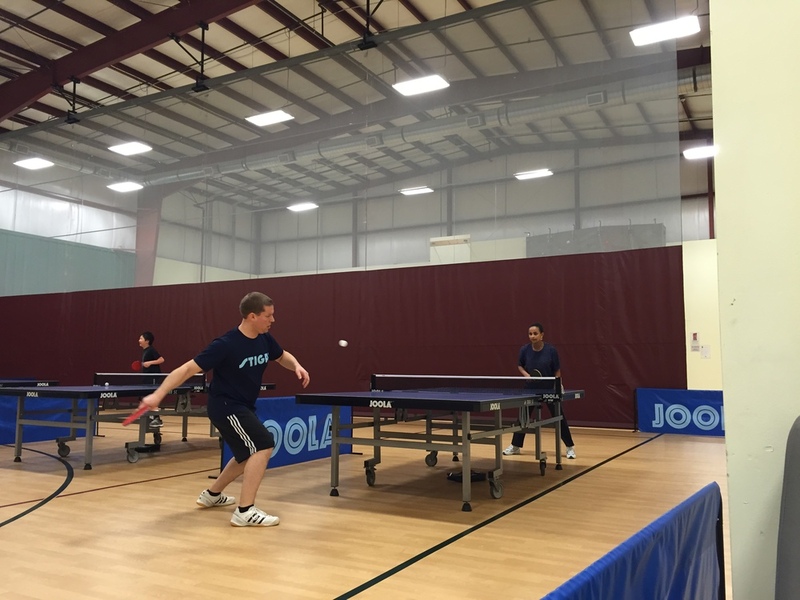 These are the tables used at the U.S. Open and U.S. Nationals tournaments. If you’ve only played on recreational tables in a basement or garage, you should come try this out...it’s a whole different experience. Our facility has good lighting, high ceilings, plenty of space for each table with nice synthetic wood flooring that is not slippery. There’s also plenty of extra room for seating, gym bags, and spectating. On the first Saturday of each month, we do a tournament and provide pizza for all the players...lots of fun! One of the aspects of table tennis that has always intrigued me is the strategy. Table tennis has been described as “chess played at light-speed”. I win matches all the time against players who by all accounts are better athletes and have better technique than me. The reason I win...I have better tactics and strategy. I love that players with physical limitations can still excel at table tennis. Another not commonly known aspect is the tremendous amount of technology used in table tennis equipment. I don’t think there is another sport that offers as many technical variances as table tennis. Just check out this table tennis website and see how many different types of blades and rubber they offer (and this is just a fraction of what’s available globally). Whatever your reasons would be for coming, I will help you achieve your goals. If you want to learn some new skills and finally beat your friends and family when you play at home in the basement, I can help with that. If you want to do some more serious training and compete in sanctioned tournaments, I can help with that. If you just want to get some exercise, play some fun games with nice folks, and have a few laughs, then our Drop-in sessions are a great place for you to do that. I hope you are all managing the blazing heat here in Spokane, WA! I’ve been busy with quite a few table tennis things and I wanted you to know about them. 1) I’ve played in a couple tournaments recently and had some pretty decent success. In Portland, at the Rose City Open, I was able to win 1st place in the U1700 event. A few weeks later in Bellevue, at the BTTC Summer Open, I took 1st place in the U1850 event. It feels like I’m steadily improving and my current USATT rating is 1724. Now, I’m preparing for the 2015 U.S. Open, and I’ll be leaving next week for Las Vegas to compete! I’m feeling good and I’m excited for the experience. Cody Hagel is also going to compete. So, wish us both good luck! 2) I’ve been coaching lots of kids! As I’ve said before, I’m convinced the key to growing the sport of table tennis in Spokane is to get more kids to play, and I’ve been working hard to achieve this goal. I recently started volunteering at the Girl Scout’s summer camp, teaching girl scouts how to play with weekly clinics. It’s a little crazy teaching 14 five and six year old girls how to swing a paddle, but it’s been a lot of fun so far. I’m also working with a group of kids at the new Beginning Juniors class at WCTT. We have a great group of enthusiastic kids and they are already learning and improving significantly! Special thanks to John, Chris, and Cody for volunteering to help with the class. 3) Thursday night Drop-in at WCTT has been going well, and, yes, the gym is air-conditioned. Come to Drop-in this week and help me practice one last time before the US Open! (FYI – Drop-In will be closed Thursday, July 9th). That’s all for now. Have a fun and safe 4th of July weekend! On 3/29/15 we held our first tournament, the Spring Smash 2015. Some great players turned out from the Spokane area, Moscow, ID, Western Montana, and one from Salem, OR! We had a nice mix of skill levels, so everyone was able to play some competitive matches. It was a friendly atmosphere and it seemed like everyone enjoyed themselves. A big thank you to all the players and friends who participated in our first event! Here's a photo of our Group A winner Patrick Hrdlicka (right), and Group A runner-up King Trinh (left), and Patrick's son Nicholas (center). Here's a photo gallery of the tournament. Thank you Ty Johnson for the photographing the event! I'm getting ready to glue some new rubber on a new blade that just arrived in the mail today. With all the different types of equipment and manufacturers, there are literally thousands and thousands of combinations you can make. Having the right equipment is just a small part of playing table tennis, but its an important part. If you are ever in need of advice for purchasing a new paddle, or if you need help gluing or setting up a paddle, let me know. I'm happy to help! Good news! I'm now a USATT Certified Instructor. If you are a beginning or intermediate player, and you're interested in improving your game, I would be happy to meet with you during our club sessions. I'm not a professional or a virtuoso player, but I'm a student of the game. I can help give you insights with both technique and strategy. Whatever your goals happen to be, let's work together to achieve them!